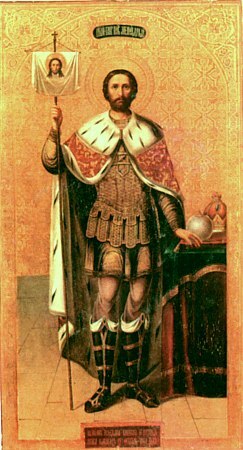 Saint Alexander became the ruling Great Prince of All Rus: Vladimir, Kiev and Novgorod. A great responsibility before God and history lay upon his shoulders. In 1253, he repelled a new German incursion against Pskov; in 1254 he made a treaty with Norway concerning peacetime borders; in 1256 he went on a campaign to the Finnish land. The chronicler called it “the dark campaign,” because the Russian army went along through the polar night, “going to impassable places, unable to see neither day nor night”. Into the darkness of paganism Saint Alexander brought the light of Gospel preaching and Orthodox culture. All the coastal region was enlightened and opened up by the Russians. Christ revealed you, O Blessed Alexander / As a new and glorious worker of wonders; / A man and a prince well pleasing to God / And a divine treasure of the Russian Land. / Today we assemble in faith and love / To glorify the Lord by joyously remembering you. / He granted you the grace of healing, / Therefore entreat Him to strengthen your suffering spiritual children, / And to save all Orthodox Christians. We honor you as a most radiant, spiritual star, / Rising up from the east; going down in the west! / As you enriched the Russian people with good works and miracles, / So now enlighten us who remember you in faith, O Blessed Alexander. / Today as we celebrate your falling asleep, we ask you to beseech the Lord / That He may strengthen his suffering servants and save all Orthodox Christians!